Built in 1929 as the headquarters for Cornelius Vanderbilt’s New York Central Railroad Company, the Helmsley building (230 Park Avenue) straddles the avenue to the north of the railroad terminal. 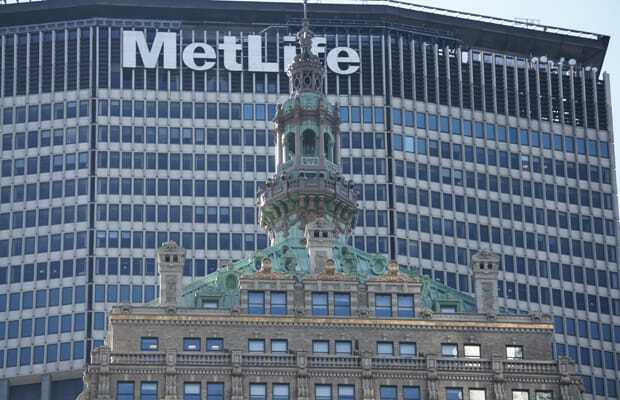 Before the Pan Am Building (now MetLife) was built behind it, the 35-storey New York Central Building—as it was originally known—dominated the view from the north. The original plans by the architects Warren & Wetmore (who also designed the Vanderbilt’s hotel and train terminal) called for a second tower to the south to straddle the station in a similar fashion. The building was owned briefly by the General Tire Company before it was sold to Helmsley-Spears. With their purchase, Leona Helmsley had the building’s ornaments gilded, and emblazoned the family name high above the entrance. The former owners had similarly renamed the building, but that modification only required changing the letters C and T.
The building is unique in that much of the street level is occupied by vehicular tunnels. An ornately decorated but relatively narrow entrance sits between the two arched car passages. Taking up more floor area, these tunnels turn away and then straighten inside the footprint for cars to bypass the train terminal to the south. Centered above the entrance and archways is a large art-deco clock designed by Edward McCartan. Flanking the clock are two stone figures of Transportation (the man) and Industry (the woman). The tower of the building is a grey buffed-brick, as opposed to the limestone base, and extends uniformly until the last several stories. Then it bulges outwards with projecting columns that are supported by inverted volutes that provide no structural support. The roof is a copper pyramid that is crowned with a distinctive cupola; both are illuminated in the evenings. The sides of the building are flanked by a 15-storey base that gently opens out in a curve to form the H-shaped plan. The parapets of the lower base are decorated with a repeating series of buffalo heads, a reference to the railroad. The building was sold in 1998, though its name remain unchanged. In the previous year it was designated a New York City Landmark. Incidentally, on September 10, 1931, mafia boss Salvatore Maranzano was murdered by hit men sent by Lucky Luciano and Vito Genvese.